The AIMB-215 B1 with Intel® Celeron™ J1900/N2930/N2807 processor is designed for industrial applications that require enhanced computing performance and power management capabilities. The embedded controller tiny module VDX2-6518 is designed with backward compatibility in mind, to provide migration path for projects facing end-of-life challenges with their existing x86 based tiny module controller. This versatile controller is designed as a plug in replacement, with backward compatibility to support legacy software to extend running product life cycle without heavy and time consuming work. The PCM-3372 utilizes an onboard Intel Ultra-Low Voltage Fanless VIA Eden V4 400/600 MHz, which makes the PCM-3372 one of the smallest and most powerful SBCs on the market. The PCM-3372 gives developers a low power, high performing and scalable platform that can fit into the tightest places. PC/104+ I/O expansion allows features to be quickly added using any one of EMAC’s many PC/104 or PC/104+ expansion modules. The PCM-3372 is perfect for applications such as military and industrial automation where uncompromised performance in a limited space is required. 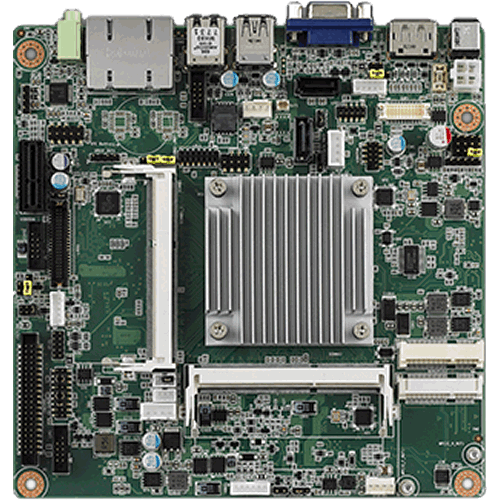 The PCM-3372 provides the quality features available on SBC boards several times its size. The VIA CX700 graphic chipset has excellent graphics performance and provides flat panel support using digital dual independent displays with CRT and LVDS interfaces. SDRAM memory capacity up to 1GB is large enough to accommodate the latest operating systems, including Linux, RTAI Real-Time Linux, Microsoft Windows XP/XPE, Windows CE.net, Windows Vista and DOS 6.22. Six USB 2.0 ports are available as well as 2 serial ports (RS-232 & RS-232/422/485). With its industrial grade reliability, the PCM-3372 can operate continuously at temperatures up to 140º F (60º C) without a fan. The numerous features provide an ideal price/performance solution for high-end commercial and industrial applications where stability and reliability (no moving parts) are essential.